Jammu, January 31: Minister for Tourism and Culture, Mr. Nawang Rigzin Jora has said that this year Shiv Khori festival would be celebrated with renewed grandeur to attract the pilgrims visiting Mata Vishno Devi and other shrines of Jammu. The Minister was reviewing the arrangements being made for celebration of the festival scheduled on February 20. Minister of State for Home, Tourism and Culture, Mr. Nasir Aslam Wani, Divisional Commissioner, Jammu Dr. Pawan Kotwal, Commissioner Secretary, Tourism and Culture, Mr. Attul Duloo, Deputy Commissioner, Reasi, Smt Sheetal Nanda , Director Tourism Jammu Mr. R.S. Mehta and other senior officers of Tourism Department were present on the occasion. The Minister also sanctioned Rs 4 lakh for meeting the arrangement expenses and asked Divisional Commissioner, who is also Chairman of Shiv Khori Shrine Board, to personally monitor the arrangements so as to avoid inconvenience to visiting devotees. The Cultural Academy has been asked to organise cultural programmes on the occasion apart from the programmes presented by the local artists of the area. He asked concerned officers to launch a massive publicity campaign through print and electronic media to attract participation of maximum people in the festival. The pilgrim tourism in Jammu & Kashmir State is emerging as a big economic activity, and the need was to take devotees to newly developed religious places. On one hand this would help to further promote religious tourism and on the other create means of income for locals around the shrine. The Minister asked Director Tourism to also invite Song and Drama Division to make the event more festive and attractive. 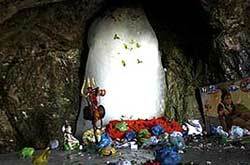 Read more information on Shiv Khori (Festival).